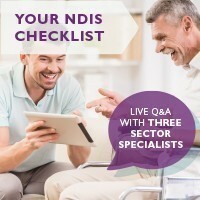 Join a live panel of three NDIS experts as they present practical advice and actionable steps that organisations can take in addressing the changes ahead. The session will cover the risks and rewards of implementation strategies before a Q&A session where participants can examine how their organisation can stand out from the crowd and manage the changing conditions of the NDIS. how to engage with and attract clients. Natasha Hudson moved to Canberra from Canada, where she drafted accessibility regulation for the Ontario Government. In Canberra she was an adviser to COAG’s national disability reform agenda with the ACT Government in 2010. She has represented government on national working groups and advised senior executives and ministers on a range of issues, including the implications of the NDIS in response to the Productivity Commission inquiry, and subsequently as part of their consideration of becoming a launch site. Hudson has relocated to Newcastle where she has been contracting with for-profit and Not for Profit organisations affected by the NDIS. Caroline van Til has over 20 years of experience and particular expertise in: leading complex change and transformation projects including: sector and organisation transformational change, developing ‘greenfield’ companies, driving organisational realignments, facilitating mergers and acquisitions, introducing corporate and shared services, and affecting business closures. Caroline has held Board positions previously with the Australian Marketing Institute; and Save the Children Fund. She has a Bachelor of Arts degree; Masters of Business Administration with majors in Marketing and HR; and is currently studying a Certificate in Entrepreneurship and Innovation at Stanford University in the USA.